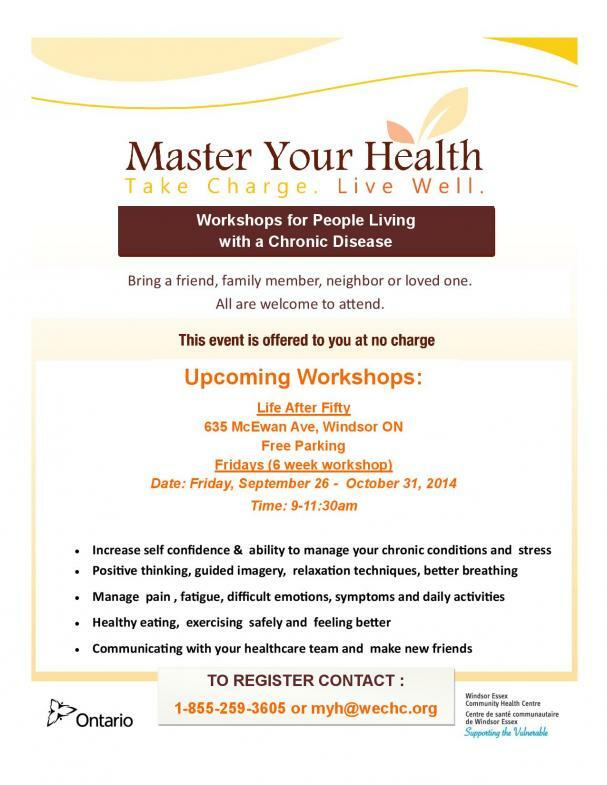 Participate in this set of FREE workshops that are designed to help those living with a chronic disease. Topics of discussion range from: increase self confidence & ability to manage your chronic conditions and stress; Guided imagery, relaxation techniques, enhance breathing; Pain Management, fatigue; Healthy eating, exercise safety and feeling better. 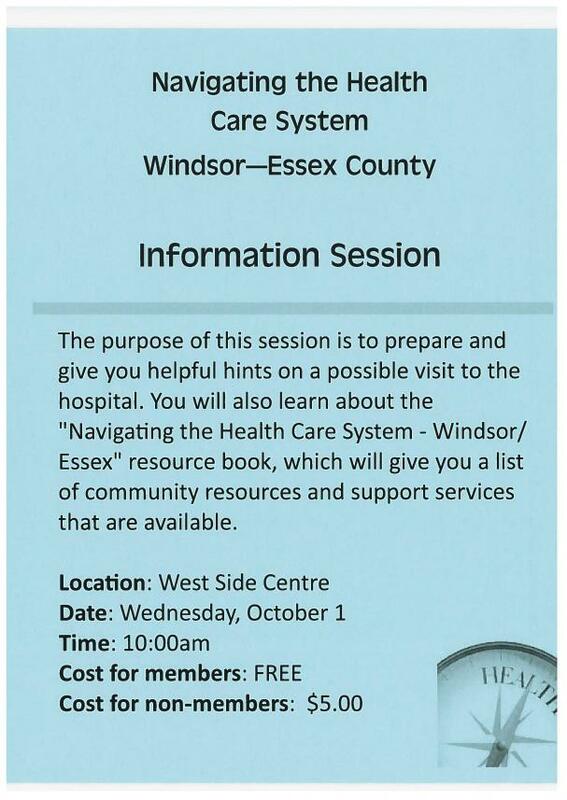 This program is presented by the health care team at Windsor Essex Community Health Centre. To register please contact: 1-855-259-3605 or myh@wechc.org. 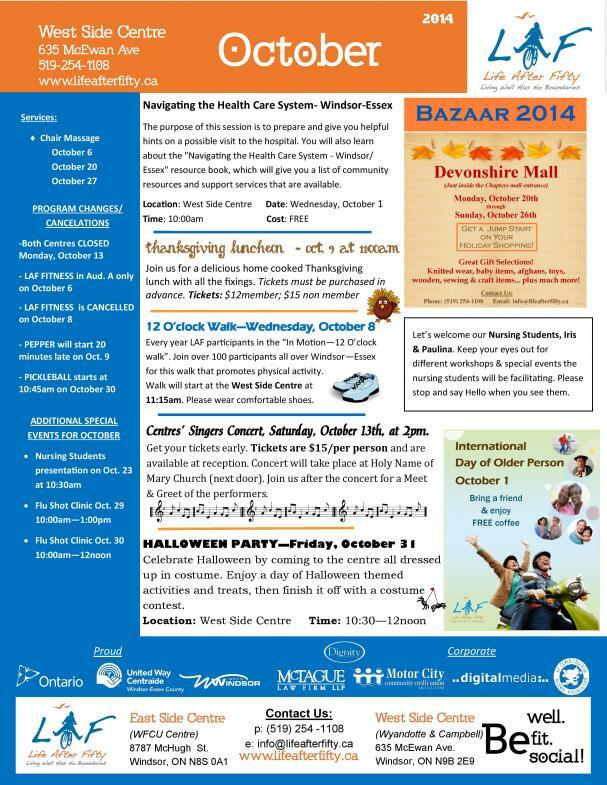 On Wednesday, October 1st, 2014, representatives from the Windsor Seniors Advisory Committee, CARP - Windsor Essex, the National Pension Reform Committee, the Unifor Retirees, the Municipal Retirees Organization Ontario and Life After Fifty, welcome you to join in a celebration of National Seniors Day! National Seniors Day is a day to celebrate and recognize the contribution that our seniors make in our everyday lives. Join us in supporting our seniors to live active, healthy and independent lives. Everyone is invited to join at City Hall Square beginning at 2pm. The formal program will begin with a flag raising and singing of the National anthem by the Life After Fifty choir, followed by comments from the senior organizations represented. Guests will then be invited to adjourn to All Saints Anglican Church Hall (immediately adjacent) for some light refreshments, compliments of Chartwell LaSalle. Key note speaker Howard Pawley, Canadian professor and former Premier of Manitoba will speak about the "Contribution of Seniors as Volunteers in our Communities. Admission is free. We hope to see you there! Learn about community resources and how to navigate a possible trip to the hospital. 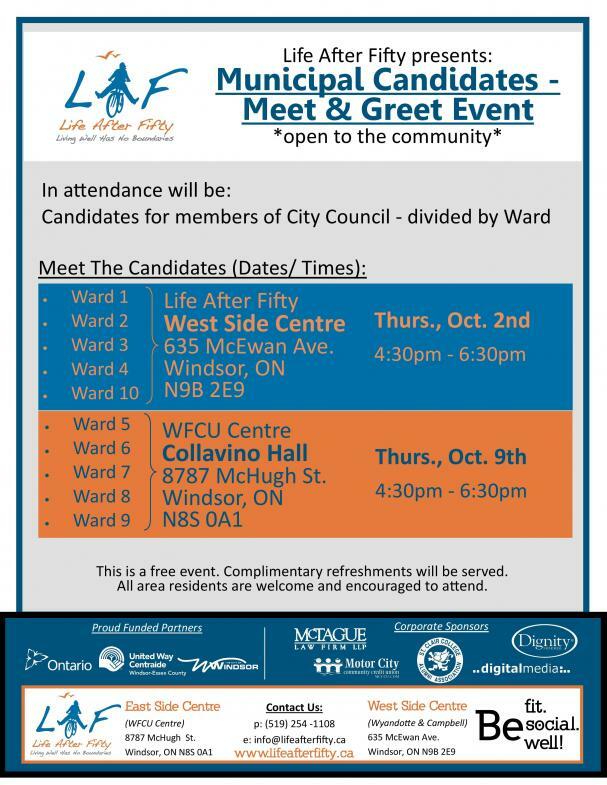 Come meet the candidates & get your questions answered!